He had also combined his God-given talents of storytelling with writing to become a relatively proficient newspaper reporter and poet. Jack had made his way to Nebraska in 1875, where he was working as a paid journalist for several newspapers. He found himself professionally and personally drawn to the activities occurring in the Black Hills of Dakota. Joe Gossage, the editor of the newspaper in Sidney, Nebraska (later the owner and publisher of the Rapid City Journal) lent Crawford a horse to make his first reporting trip to the Black Hills in 1875. 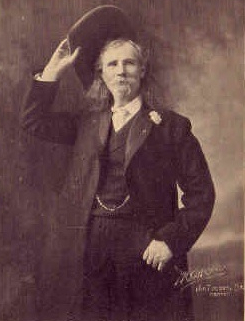 Jack began to immerse himself in the country he was chronicling for eastern newspapers, and after arriving in Custer City, Dakota, was elected to the town council. During the months that followed, news reports and sensationalism from the journalist helped to fan the fire of the famous Black Hills gold rush. “It was here that we were overtaken by Captain Jack Crawford, widely known East and West as “The Poet Scout.” Crawford had just heard of the Custer massacre, and had written a very creditable poem upon receipt of the news. His pen was always ready, and he made many epics of the West, many of which are still popular throughout the country. Jack was a tenderfoot at that time, having lately come to that country. But he had abundant pluck and courage. He had just brought dispatches to Crook from Fort Fetterman, riding more than three hundred miles through a country literally alive with hostile Indians. These dispatches notified Crook that General Terry was to operate with a large command south of the Yellowstone, and that the two commands would probably consolidate somewhere on the Rosebud. On learning that I was with Crook, Crawford at once hunted me up, and gave me a letter from General Sheridan, announcing his appointment as a scout. He also informed me that he had brought me a present from General Jones, of Cheyenne. “What kind of a present?” I inquired, seeing no indication of any package about Jack. “A bottle of whiskey!” he almost shouted. Did I hear the news from Custer? Well, I reckon I did, old pard. And you bet, it hit me hard. If I didn’t shed regular tears.